Kathy Zahedi, DDS & Associates are experts in installing crowns to protect damaged teeth or enhance the appearance of your smile. The practice is located in Santa Monica, California area. A dental crown is a cover placed over a damaged tooth that restores its natural strength, shape, and appearance. Crowns are often called caps because they cap, or encase, the entire visible part of the tooth. Dr. Zahedi ensures that each crown is individually made so that it looks like the original tooth and fits comfortably with all the remaining teeth. A variety of materials is used to make dental crowns. Porcelain or ceramic crowns are the most natural looking because they can be tinted to match the color of your teeth. Not all crowns are permanent. 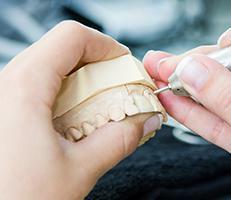 Temporary crowns are often made of stainless steel or a resin matrix in the shape of the original tooth and are put in place until the tissues heal or the permanent crown is finished. 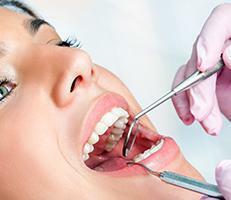 Root canals are one example for when a temporary crown is needed. Once the root canal is fully healed, the temporary crown is removed, and the permanent crown will be put in place. Permanent crowns are designed to be long lasting, at least 8-12 years, but the quality of daily dental care (diligent brushing and flossing) can significantly extend a crown’s longevity. Crowns are used to both protect damaged teeth and improve their appearance. They are used when the portion of the tooth that is above the gum line is damaged in some way. This includes: cracks, chips, and breaks. A crown may also be used to cap a tooth that has excessive decay or cavities that can't be remedied with fillings. Crowns are also used to cover dental implants and provide protection to a tooth that's had a root canal.